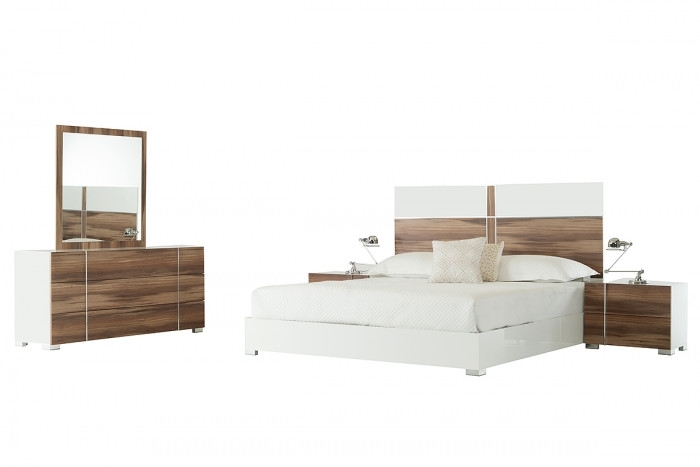 The Nova Domus Giovanna Italian Modern White & Cherry Bedroom Set features a rich white gloss and Cherry veneer finish with stainless steel accents on the headboard, dresser, and nightstands. Both the 3-drawer dresser and two 2-drawer nightstands are equipped with a soft-closing mechanism. Providing a few space between the floor and this modern bedroom set are sturdy stainless steel feet. A mirror framed in Cheryl veneer finish is included in this made in Italy modern bedroom set.